Each year, the holy and ancient city of Fes, Morocco is host to the Fes Festival of World Sacred Music. This festival brings together sacred and world music from many different cultural, religious and musical traditions. This year’s theme, “Fes: An African Reflection” recalls how Fes was once the intellectual, cultural, spiritual and commercial hub of an Empire which traded and connected with its neighbors across mountains and deserts. The opening night of the festival, held on May 22nd at the magnificent Bab Makina venue, wowed the audience as they were taken across the borders of ancient empires to meet these fascinating peoples and learn their customs. 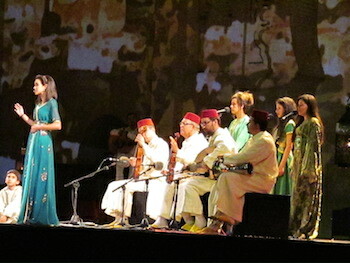 As the daylight dimmed and the swifts ceased circling over the rooftops of Old Fes, the last of the VIPs took their seats at the front of a sell-out venue for the opening concert of the 21st Fes Festival of Sacred Music. HRH Princess Lalla Selma – representing King Mohammed VI, who is patron of the Festival – arrived in a huddle of black-suited security in a stunning white and gold caftan, to a patter of applause and a burst of flashbulbs. Once the audience was settled, the welcome address was delivered in Arabic, English and French and our journey – in the footsteps of Leo Africanus (Hassan el Wazzan, 16th century diplomat, traveler and chronicler of Africa) – took us across North and West Africa, from tribe to tribe and tradition to tradition in a full circle until we returned back to the holy city of Fes. This year’s opening night -for the 21st edition – was a true spectacle. As we journeyed southward, over 100 artists gave us a glimpse of the musical and cultural traditions along the way: from the Amazigh fables of the Moroccan mountains, to the Andalusian traditions of Fes. From the griot heritage of West Africa to the Simb Lion dance of Senegal. With each step along the journey, the backdrop – which began with Fes famous Bab Boujeloud gate projected on the walls of the Bab Makina – changed from Savannah to desert camp, to palm oasis and back to imperial city. Moroccan oud master, Driss al Maloumi, opened the show with an Amazigh fable about a sad moon under a backdrop of a full moon and a starry sky. Then to follow, Amazigh songstress, Chérifa greeted the crowd. A real highlight was the Masks of the Moon Bwaba Ritual, the group performing for the first time outside their native Burkina Faso. Their startling black and white costumes and the haunting melody of the percussion accompanied an incredibly energetic and ritualistic dance. On a gentler note, Malian Ballaké Sissoko, gave the audience a real treat as he appeared on stage with no less than 10 koras, of the Kora Ensemble of Bamako. 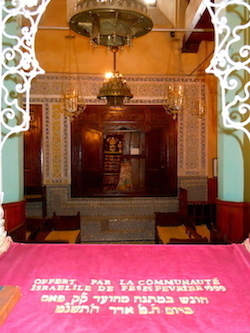 After a whistle stop tour of Africa, we arrived with Hassan al Wazzan back in Fez, at the tomb of Sidi Ahmed Tijani, founder of the Tijani Sufi brotherhood. The evening concluded with the Tijani brotherhood singing a song familiar to all the Fassi (Fes natives) in the audience. 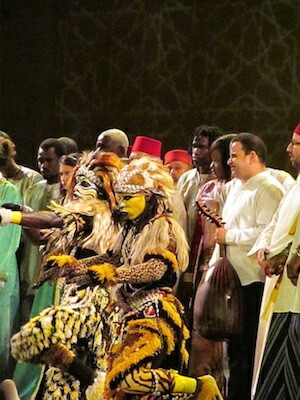 The opening event certainly got the Fes Sacred Music Festival off to an impressive and inspiring start. Many of the artists present will appear at over 50 concerts and events over the 9 days of the festival until 30 May 2015. Streams of light illuminate the elaborate the Romain ruins of Volubilis accentuating each crevice line and jagged edge with a stream of shadows. As the sun sets the ivory Corinthian columns slowly fade from sepia tones to midnight black silhouettes. On a crisp day in Volubilis tourists snap a series of photos to capture the site’s magnificence. 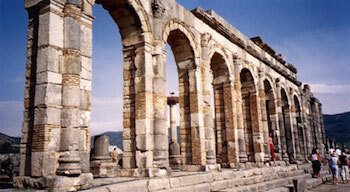 The ruins and mosaics of Volubilis harbor a rich and compleix. 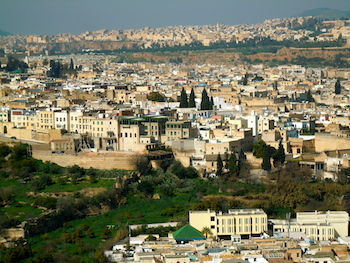 Archaeological traces in Voubilis have determined that the Romans occupied the area during the 3rd century BC and established a city of nearly 200,000 people. During this time the city served as the heart of Roman administration. It was an active part of Roman, North Africa producing grains and olive oil exports in the surrounding fertile regions which contributed to its immense prosperity. 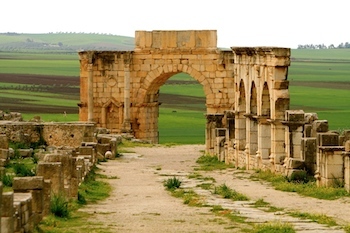 Volubilis is easily accessible as a day trip from both Meknes and from Fes and a must see historic destination on a Tailor Made Morocco Tour. 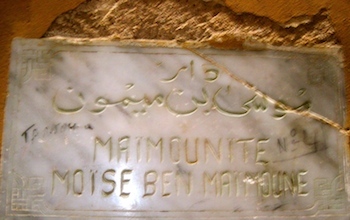 This area among other nationally recognized attractions in Morocco is part of the UNESCO World Heritage Site. Voubilis is an archaeological thrill for those passionate about exploring some of the best preserved Roman remains in the world. The dusty roads leading to Voubilis, also referred to as Walili, weave through the winding countryside. The ruins are deep within the gentle rolling hills and flush mountain terrain. 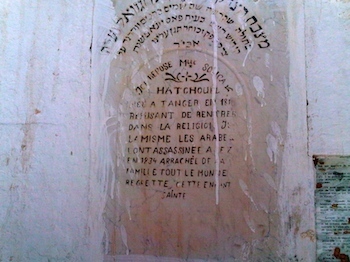 The site covers around 800 by 600 metres. Surrounding the ancient remains is a garden of wild plants, and the sound of roaring waters from nearby streams invoke a feeling of serenity. Standing from a distance travelers can look onto the horizon towards the vibrant blue skies and see the elegant temple remains, pillars and the dominant Triumphal arch. 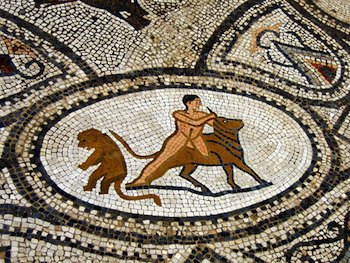 Having survived a few massive earthquakes throughout ancient times, there remain over 30 well-preserved mosaics revealing scenes of ancient Roman culture and mythological creatures. For more information about the Roman ruins of Voubilis.